British birders, Tom Bedford and Richard Campey visited Oman over the past two weeks. I teamed up with them on Monday afternoon to visit Khawr Rori. This blog looks at the some of the more special birds we saw. Our visit to the main water body started well. Close to the large numbers of northern shoveller, pintail and garganey was a lone cotton teal. This Indo-Malay bird comes to Dhofar each winter and can be present in small numbers as late as June. 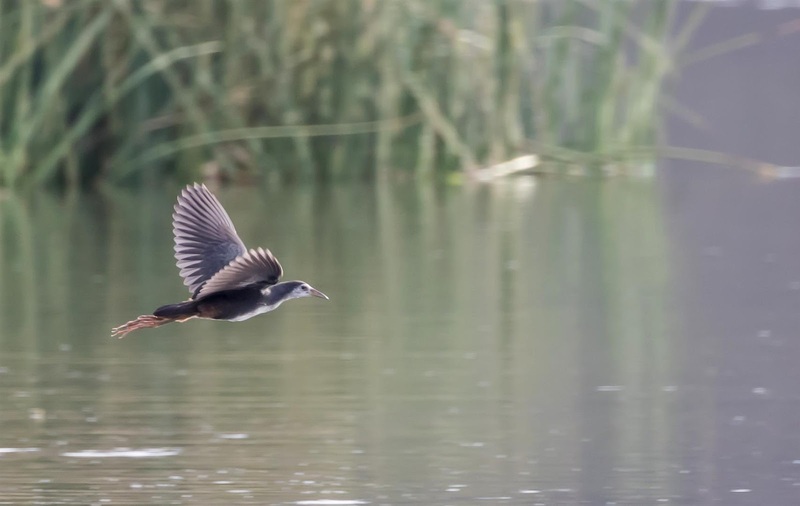 There is an almost identical visiting pattern for pheasant-tailed jacana though some of these may actually also breed locally in early summer. This second Indo-Malay speciality was also present. Two were seen though views were into the sun. We interrupted our water watching to look at a large flock of blue-cheeked bee-eater which turned up. There were at least two dozen. Now is peak time for their passage through Oman. While we were viewing the bee-eaters, a bird flew right past us. Tom Bedford managed to catch a couple of snaps. Only afterwards was it realised that it was a white-breasted waterhen. I am grateful to Tom for permission to reproduce his photograph. Water-breasted waterhen is yet another Indo-Malay migrant. Not all the birds in small numbers were Indo-Malay. The single first greater white-fronted goose has arrived from the north Russia. It was associating with the much more numerous flamingo. A single greater spotted eagle was on site. Black-tailed godwit was one of the most common waders but a few Pacific golden plover were among the most interesting. I enjoyed birding with Tom and Richard. I hope they enjoyed Oman. Pretty amazing stuff. Wish I had birding like this on my doorstep. You are welcome down here any time!